The past two days have been emotionally exhausting, much like the weekend. I have found myself gritting my teeth, clenching my jaw, and fearing the worst. I walked my students to their art class on Monday and constantly thought about what we would do if some psycho came barreling through the building. I hate that it has weighed so heavily on my mind, but I also know I am preparing myself mentally and physically for possibilities which, sadly, could take place. I re-read my “I will” statements several times to myself throughout the day Monday and today just to remind myself what I said I would do. I have turned the channel or turned my head when his face appears. I don’t care why he did it. I don’t care about his name. I won’t even speak it. He does not deserve my attention for any reason what so ever. That’s my choice. I have talked to my “little soul” which I mentioned at the end of the day both days, smiled at him often, and asked him how he was doing. He has had two great days and both ended with a smile and a, “See you tomorrow.” He’s not the only one I’m concerned for, but just one of the cherubs I’ve taken time to hug and smile at. I have talked to those that needed to talk. I fought back the tears. There were a few who did not know of the events and out of respect for their parents I chose not to have a class discussion. Instead I talked with several of them one on one. It was interesting to hear their viewpoints as to why or what happened. So many have still not lost their innocence. Thank the Lord. 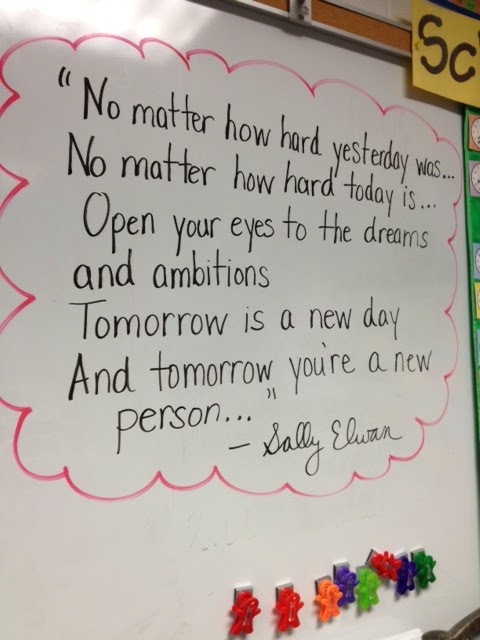 I left this quote on our board yesterday and today. Many asked me why. I told them it was something that made me feel better after being so sad from the weekend. I hoped that it would help them as well. I saw many writing it down in their assignment notebooks. It was worth it. Thanks to my sister for sharing it. I have delivered my thoughts to those above regarding my concern for our policies. I plan to continue to speak and do what I can to keep my students as safe as possible. I have a pile of cards and letters to send. A coworker also received the idea to send snowflakes to help make their new school a “Winter Wonderland” when they return back to a new building. I plan on spending time tomorrow making all kinds of colorful snowflakes with words of encouragement to send to Newtown. I also saw an idea on Facebook of 26 random acts of kindness in memory of the 26 lives lost. I’m going to spread this message to students as well and I’m going to document my 26 random acts of kindness on the board so they can see my ideas, and hopefully share the love as well. I have stayed out of the gun control debate. I have my thoughts, my opinions. They are my own. I was hoping the media would also stay away from the autism accusation of violence. They haven’t. So I promise to fill any clueless person in on the real deal of autism. What I know from who I have worked with. I will be sure to let them know it is not a “disease” that results in a “killer” which are terrible words straight from the media. I have prayed. I squeezed my beautiful niece so tight when I saw her Sunday. I squeezed my precious little nephew for as long as he would let me before he wanted “Down!” I squeezed and kissed the face of my oldest nephew who has the best smile when he sees me. Some day very soon I know he probably won’t allow me to do that. I’m going to for as long as he will let me. I have made it through the first two days of a week. I have battled nothing compared to those families who lay precious children to rest. I have battled nothing compared to those families who lay their precious moms, daughters, and sisters to rest. I have battled nothing compared to the rescue workers who had to see the tragedy first hand. I have thought of them often. I have prayed for them constantly. This just touched my heart. Hugs.